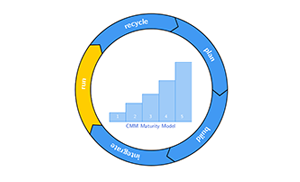 CMM Level is a model that defines the benchmark of maturity in the software development process of an organisation.CMM is basically used to gauge an organisation’s structure and approach towards the software development process by assessing the ‘Key Process Areas’ (KPA). If you are in the quest of how to check CMM level of a company then below is the maturity levels that helps you understand better about the same. ● Maturity Level-1 (Initial): The process followed is mostly chaotic or ad-hoc with no project tracking system for predicting cost and time schedule. ● Maturity Level-2 (Managed): The process followed contains the required basic software/tools installed but lacks discipline and coordination amongst the various intermediary groups. ● Maturity Level-3 (Defined): The process followed has all the necessary software/tools installed with a well defined set of guidelines followed by developers for a disciplined execution of multiple projects at any given time. ● Maturity Level-4 (Quantitatively Managed): Along with the conditions being met in level-3, an organisation also has a distinct process to maintain the quality of the projects. ● Maturity Level-5 (Optimizing): This has all the goals met in levels 1-4 with the addition of constant innovation and optimization for streamlining the development process by eliminating defects.